Despite 45 million Americans going on diets every year and spending in excess of $33 billion on weight loss products, 2/3 of the population is overweight or obese. Our nation needs education about nutrition, now more than ever! Being overweight doesn’t just provide physical limitations and health issues, it can cause problems in our relationships, making people feel self-conscious and disconnected from the person they truly feel they are. You’re reading this article now, so maybe this resonates. Are you struggling to lose those 10 lbs. you know will make all the difference to how your wardrobe fits and how you feel in your clothes? Maybe you’re sick of getting crappy sleep and your energy levels taking a huge nose dive throughout the day or during your work outs. Or maybe you’re just tired of being “on-again off-again” with your diet, yo-yoing between programs that don’t fit your lifestyle and just want some simple and sustainable habits you can stick to. Whatever it might be that’s frustrating you about your nutrition, don’t worry, we’ve had those frustrations too, but we’ve lived to tell the tale! Now that we’ve overcome our challenges with nutrition, we know from our own experiences and our clients, that good nutrition truly is at the foundation of reaching our full potential in day-to-day performance, sport, health, physique and even our mental well-being. We know how profound its effect can be in many facets of our lives, whether it helps you reach the podium in your chosen sport, or simply helps you feel more at ease when you’re lounging by the pool or enjoying some quality pillow talk with your significant other 😉 Well we have some exciting news for you! Because despite what you think and believe, you can easily improve the quality of your diet and achieve that ideal version of yourself in the process. Good nutrition practices don’t have to be complex, in fact, life’s easier when they’re simple! As Tony Robbins says, “complexity is the enemy of execution” and we’d agree! We promise you, that a life full of vitality is easily within your reach without you investing an eye-watering sum of money. Here’s 7 of the most common nutrition mistakes we encounter with our clients. Do any of them sound a little all too familiar to you?! Monday through Friday you do a great job eating your version of healthy, but then the weekend comes along and you easily consume twice the amount of calories on Saturday and Sunday – and maybe even Friday with all those happy hour drinks. Amirite?! Don’t feel bad, most habits rely on routine, so it’s no wonder your healthy eating practices suffer when a weekend full of unplanned food is thrown at you. We don’t expect you to give up your social life! We teach you how to bring more consistency to your caloric intake, by developing awareness about your food choices, helping you to plan ahead and make smarter choices when you’re eating out or going to social gatherings. We also give you information about strategies like intermittent fasting, which can be as simple as skipping breakfast, and set you up in our coaching platform so that you receive helpful reminders to stay on track even though it’s the weekend. The problem with the western diet and convenience foods is that they often contain too many carbohydrates and fat and are high in sodium. 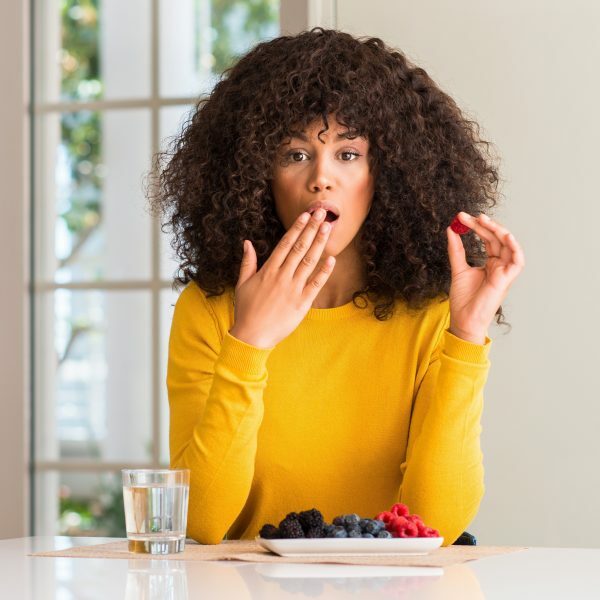 Because our bodies like homeostasis – which is really just a nerdy science word for balance – this effects the fine balance of our cells causing bloating and weight gain. Even if you are keeping your calories in check, a disproportionate balance in macronutrients (your carbohydrates, fat & protein) could be undermining your body’s ability to shift fat. Perhaps you think you’re aware of the foods you eat and take care to enjoy mostly good quality, whole foods that don’t come out of a packet, but maybe you prescribe to a low carb diet like Paleo, or a high fat diet like Atkins or keto. Or maybe you restrict both carbs and fat and eat way too much protein! Whatever it is you’re doing, an imbalance by restricting or over consuming any one macronutrient can cause our bodies to either gain weight or hold on to body fat. We help you identify where you are, where you want to be and how to get you there. We help you close that gap to becoming your future self by assisting you with your macronutrient goals and teaching you how to eat the right foods to get that balance of macronutrients daily. Along with our meal plans and coaches, we help you navigate food labels and teach you how to keep your sodium consumption in check too. Reports suggest that up to 75% of the American population fall short of their daily hydration requirement, so we’ll hazard a guess and say that you’re probably not drinking enough either. Oxygen and water are the life-force of our cells. Inside cells, water is used for the breakdown of substances, as a medium for chemical reactions and for the diffusion and osmosis of substances. Outside of our cells, water assists with bodily functions such as digestion, absorption, circulation, creation of saliva, transportation of nutrients and maintenance of body temperature. Without the right balance of water, our bodies cannot operate optimally, leading to issues such as cellular atrophy, muscular fatigue, slowed rate of metabolism, reproductive dysfunction and a reduced ability to fight disease. A simple step such as drinking a glass of water as soon as you get up in the morning, can radically improve your health, energy levels and ability to maintain your ideal weight. Being sufficiently hydrated can not only help you maintain a healthy weight by allowing your body to perform it’s functions effectively, but drinking water can help satisfy cravings and keep feelings of hunger at bay, making it easier for you to keep your caloric intake in check. Our thoughts about being overweight these days are mostly centered around the belief that we’re eating too much and that we need to drastically restrict our calories to lose weight. As we mentioned before, an estimated 45 million Americans go on diets every year and yet 2/3 of the population is still overweight or obese. People do all sorts of absurd things like only eating one meal a day, restricting calories to 800 calories or less a day, going on a juice cleanse, a smoothie diet or joining something like weight watchers. If this sounds familiar don’t be ashamed, we’ve been there too and we’ve tried them all! In our experience though, about half of our clients aren’t actually eating enough! I mean you’re probably skim reading this article right now thinking to yourself “I haven’t got time for this, just tell me what I need to do!” So finding time to eat for some people simply isn’t happening. On top of that undereaters might also be using exercise as an additional means of shifting their bodies into a caloric deficit. The problem with doing this is that you actually push your body into a state of energy deficiency, forcing important bodily functions, like your metabolism, to slow down and become less effective. Guess what our bodies don’t like to do when they’re deprived of fuel? Yup you guessed it, lose body fat! We understand how intimidating it can be at first to eat more food. Because all of our coaching programs are personalized and come with your own coach, we help you make small, incremental steps to increase your food volume so that you can start repairing your metabolism. Instead of gaining weight from eating more, you will actually start to lose those 5-10 lbs. your body has been refusing to let go of as you ramp up your metabolic rate. Caloric restriction can often be coupled with an “all or nothing” mindset. The danger of this kind of mindset is that it means when you’re in, you’re all in! But if you make the tiniest little slip up, then you’re out. And when you’re out, you’re really out! I’m talking about surrounded by empty pizza boxes and Oreo cookie wrappers kind of out! The problem most of the time is that operating under this mentality of total restriction and inflexible commitment is not sustainable and if you don’t see immediate results from all your hard work then you’re not going to stick with it. Consequently, you bounce from program to program only ever giving it your all for a couple weeks at a time before throwing in the towel and convincing yourself that either there’s something wrong with the program, or that your body is in some way broken and can’t be fixed. Well news flash, you’re not special – we’re sorry, we know your mom probably told you otherwise! You’re not a snowflake, your body just needs some time to recover from all the damage you’ve done to it and 30 days of better eating is not going to undo the last 20 years of living! Coaching and accountability. We understand that success comes from a customized solution so we don’t just give you a cookie cutter program and send you on your way. We work with you to help unwrap the complex relationship you have with food and dieting and have you take sustainable steps so you can move forwards and make progress in a healthy way. We lay out our action plan, check you’re on board with each step and then make sure you follow through. It’s called coaching! Despite the heightened awareness around consuming more protein these days, most people still aren’t eating enough. Protein is primarily responsible for helping to build strong muscles and bones it also helps keep our immune system boosted, allows us to recover from workouts and is responsible for tissue repair. When sufficient protein consumption is also combined with the right training, lean muscle tissue will grow, which in turn will speed up your metabolism allowing you to get leaner, faster! Unfortunately there are also those who go too extreme in the other direction and think consuming twice their body weight in protein will speed up the weight loss process and turn them into a muscle bound Hulk overnight. Well I’m sorry to tell you that too much of a good thing is rarely a good thing and that consuming too much protein can actually be bad for you, putting tremendous pressure on your kidneys. We help people calculate their protein needs for their lean body mass and to support their training activity. If you’re not sure where to start, we recommend including a palm-sized portion of lean protein with every meal – foods like poultry, fish or seafood and lean meat are all great sources of complete protein. We help educate our clients about all kinds of sources of protein including those that are best for vegans. We’re realists and we’re also busy entrepreneurs so don’t worry there’s no judgment! In fact, confession time, but we don’t eat real foods 24/7 either! We don’t preach perfect nutrition, we preach better nutrition habits and healthy eating practices that create a sustainable lifestyle. Although eating whole foods is optimal, we know there’s a time and place for processed foods like frozen meals, chips, muffins and cookies. Approaching your diet and lifestyle with an 80/20 balance, will help you to be able to indulge in some of your favorite foods and meals without a feeling of regret or anxiety. There’s nothing worse than food fomo is there?! So many diets convince us to label foods as good and bad and “off-limits”, serving only to reinforce the idea that we should feel guilty and beat ourselves up when we eat them. Our program is not another diet. There are no foods that are off-limits. As well as helping you change your mindset about food, we also help you get better at anticipating and strategizing for when those types of foods might show up in your day so that you can enjoy them while still maintaining a balanced diet. We believe that having a well-rounded and balanced nutrition approach is a fundamental ingredient in the recipe to success and life-long happiness. If you can develop the kind of growth mindset, compassion, patience, commitment and systems to ensure your healthy nutrition practices maintain a routine even on your worst day, then you have the potential to accomplish anything! We specialize in helping our clients work through their relationships with food, overcoming any beliefs they might have and educating them about what good nutrition really means and how to implement it. We’ve made all these nutrition mistakes in the past and more and found a way to overcome them. If you want to change the way you think about and approach your nutrition then please reach out and take advantage of a free consultation call to discuss our coaching programs. Learn more about Jason and Roz Ackerman.